Who: This is a ladies night and is an open invitation! 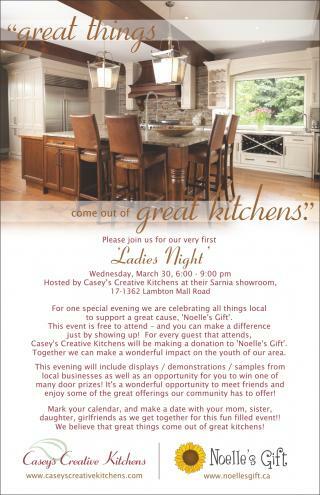 All ladies welcome! For every guest who comes Casey’s will be making a donation to Noelle’s Gift, an important Sarnia charity which helps kids get the school supplies they need to be successful. Just by showing up you can help kids in need! In addition to all these great companies, many others have donated some amazing door prizes! Door prizes include gift baskets, gift cards, product donations as well as multiple copies of the cookbook The Looneyspoons Collection, signed by co-creator Greta Podleski! We hope you will grab your friend/mother/daughter/sister and come join us! Its going to be a wonderful evening and the more guests we have, the more we help! !